If you’re reading this far, welcome. I am so glad you are not frightened off by the name of this dish. You shouldn’t be. It is the soul of simplicity, and, given that it has many variations, easier than you might think to make. Your first question is, no doubt, what the hell is a cow parsnip? Heracleum maximum, to the taxonomically inclined. It’s most recognizable characteristic is its aroma, which you will either love or hate. Obviously I love it, otherwise I would not cook with it. As with most aromas, it’s difficult to pin down: Spicy, a bit like celery only far more powerful, a tad skunky. If you’ve ever smelled lovage, you’re getting close. Cow parsnip has large leaves and flowers like a big Queen Anne’s Lace. It grows in damp places all over North America outside the Deep South, according to the USDA. Before you gather it for yourself, become familiar with it’s kinda-sorta “look similars,” as my colleague Sam Thayer likes to say — most notably, water hemlock. I don’t think they look similar at all, but then again I’ve been foraging for 35 years. A closer look-similar is giant hogweed, a nasty invasive plant that shares a lot of traits with cow parsnip, with none of the benefits. There is a great chart on how to tell them apart here. So far, this nasty only lives in the Pacific Northwest, Illinois, New York, Ontario, Michigan, Pennsylvania, Connecticut, Maine and Quebec. 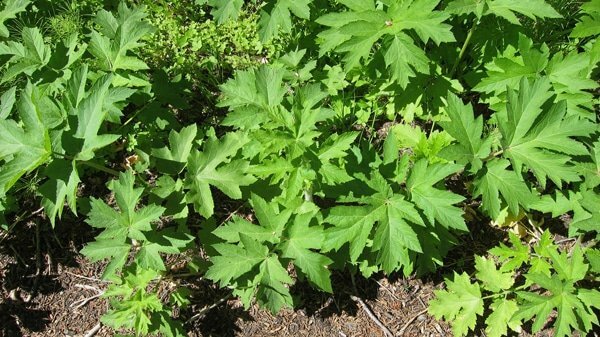 One word of caution with cow parsnip: It’s juice is a photo-toxin. A wha? Well, don’t get the juice on your skin: If you do, and your skin is then exposed to sunlight, you will get an ugly rash. I purposely exposed myself to this to see how bad a rash it was, and I can tell you it’s uglier than a sunburn but not as bad as poison oak. And it never itched, at least for me. Still, be careful. The most useful parts of a cow parsnip are its young leaves and its unripe flower stalks; I’ll get to the flower stalks in another post soon enough. For now, you want to pick the young leaves. Older leaves are too tough for making gnocchi. As for the broth, cow parsnip happens to be in the carrot family, so I thought I’d combine the two. I learned about a quick way to make clear broths — almost as clear as a consomme — from Chef Magnus Nilsson’s great book Fäviken. Nilsson just packs a pot with whatever it is he’s making a broth of, covers it with hot water and essentially makes a tea out of it. In less than 30 minutes you have a very powerful clear broth of… whatever. Carrots happen to work really well with this. The possibilities are endless, really. Yes, the flavor will be different — nothing tastes like cow parsnip — but each are good in their own way. I first made this dish in France as part of a celebration dinner for my friends Soraya and Erik’s 25th wedding anniversary — no cow parsnip there, so I used wild lamb’s quarters. Everyone loved it. The gnocchi are very light. Pillowy would be the cliche way to describe them, but it’s honestly pretty accurate if you think about goose down pillows. The carrot broth is powerful, and is much better if you have some smoked salt on hand. The flavors of cow parsnip and carrots are actually even better: It’s a general rule that plants in the same family, i.e., carrots and, say dill, or tomatoes and peppers, taste “right” together on the plate. A good reason for cooks to learn a little botany, don’t you think? ]Don't get all hung up on the cow parsnip aspect of this dish. I use it because I know where to find it, and because the flavor works well. Any green will do, as I mention above. Do get all hung up about the timing of the gnocchi, however. Make the dough right before you cook the dumplings, otherwise you will find yourself needing a lot more flour -- and your gnocchi will be heavier. You can make the carrot broth up to a day ahead. I will serve this recipe as either part of a larger, longer meal, or as a light summer dinner. 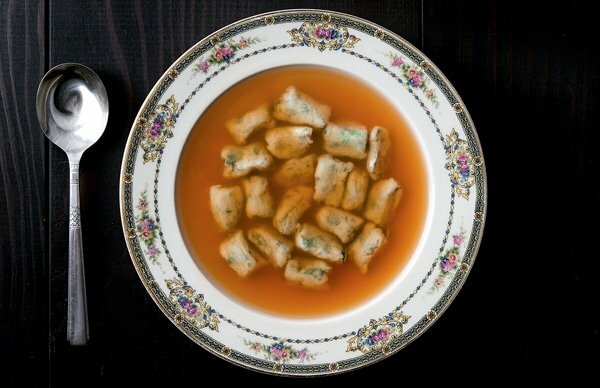 You can fill yourself up on these gnocchi, but it's more fun to serve this soup with, say, a salad and some seared duck breast or a grilled steak. This is really not that hard a dish to make. Honest. 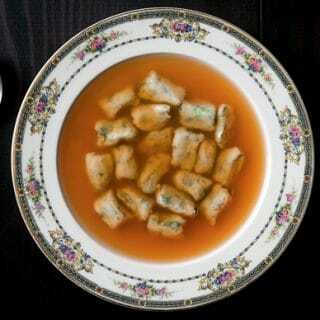 Start by making the consomme. Peel the carrots and chop them roughly. Pulse them in a food processor (or chop them fine) until they are in little bits, but not pureed. Put the carrot in a heavy, lidded pot and cover it with the water. Bring to a boil, then drop to a simmer and cook for 20 minutes. Turn the heat off, cover the pot and let this steep for 1 hour. Strain the broth through a fine-meshed sieve lined with either cheesecloth or a paper towel. Clean out the pot and return the strained broth to it. Set aside for the moment. Once the carrot broth is steeping, get a large pot of water ready; this is what you'll cook the gnocchi in. When it's boiling, add enough salt to make it taste like the sea. While the gnocchi water is ready, start by boiling the parsnip leaves for 2 minutes. Remove and submerge in a large bowl of ice water. Take the leaves out and squeeze the excess moisture from them. Mince them well, but do not puree -- unless you want green gnocchi, which is an option. Mix the cow parsnip, ricotta, salt, nutmeg, pecorino and eggs together in a bowl. Add enough flour to that the dough comes together in a mass that can be kinda-sorta kneaded, but not really. Soft, pliable, and just a little sticky. The better you get at making gnocchi, the less flour you will need. Start with about 1 1/2 cups. Shape the gnocchi dough into a rectangle (ish) in the bowl and cut it into equal pieces. Take one out and put it on a well-floured surface. Gently roll it into a log about as thick as your thumb and forefinger put together; for me this is a little less than 1 inch thick. You might need to cut the log into serviceable sections. Set those aside and work on manageable lengths. Use a knife to cut the log into gnocchi about 1 to 1 1/2 inches long. They will look a little like pillows. Gently roll them around in the flour to coat the cut edges, otherwise you run the risk of a gnocchi glob in the pot when you cook them. Set aside and repeat with the rest of the dough. To finish, heat the carrot broth until it steams. Do not boil it. Add salt to taste. 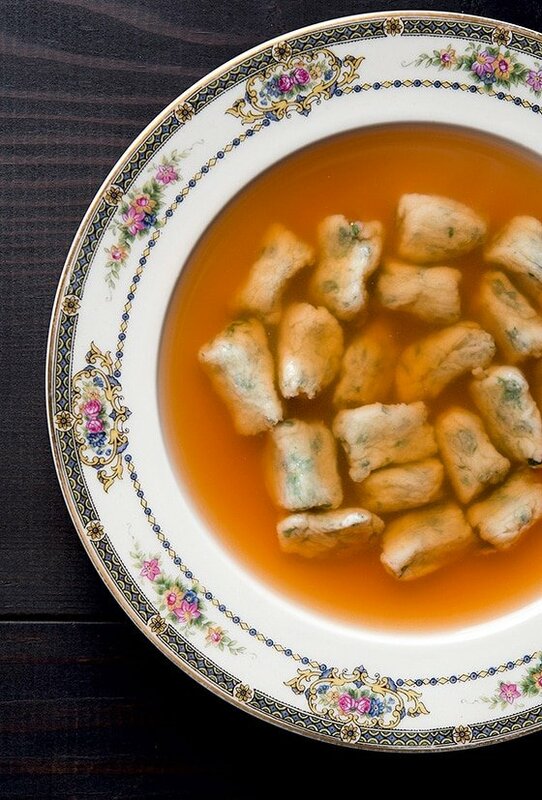 Boil the gnocchi until they float, and then for 1 minute more. Transfer them with a slotted spoon to individual bowls and pour the carrot broth over them. I am glad you warned people about the sap. While clearing out the parsnips that wintered over, I brushed some of the foliage against my side. Two days later I had what appeared to be itchy spider bites, which then turned to large painful blisters. Several of the blisters popped and are now large scars (3 months later). It took about a week or so before all the pain had receded. The blisters that did not rupture have now just become dark spots. I had purchased these seeds from a heirloom seed bank and suspect that they are closer to the wild parsnip, which can also burn you. I would just wear long sleeves and be careful while harvesting. Yeah, that wild parsnip can be nasty. I’ve heard of pretty bad scarring from the lesions.